Traveling with kids is hard. This is particularly true when traveling in developing countries that are hot, dusty, and where the population of ants trails only that of the underprivileged. We try to be accepting of certain local cultural habits and, in fact, even embrace those that suit us. For example, it’s okay to stop your car anywhere on or alongside the road for whatever reason so long as you smile and wave at those trying to get around you and it is acceptable to drink a cold beer at any time of day - it is always beer o’clock. 1. Does it have a toilet seat? Have you ever truly tried to sit down on the porcelain throne? Frankly, I have and even if you wipe if off and line it before you sit on it, it still feels just a little bit dirty. This is why, after polling focus groups, John T. Crapper retailed his invention with a seat which, perhaps surprisingly, has not caught on as the standard in Central America. Sure, you can definitely expect a toilet seat at the finer establishments, but your guess is as good as mine as to how to define a “finer establishment.” Plus, the existence of a toilet seat does not always mean you are at a five star toilet (see below). It is, however, a step in the right direction. Our toilet rating system rates this a four. 2. Does it have toilet paper? I’m not talking about a place that has run out of toilet paper and you just need to ask staff to provide a new roll. The only toilet where you are guaranteed toilet paper is a public restroom that you have to pay to use and even then, the five or six squares of paper you are handed for your 25 cent equivalent entry fee isn’t going to cover a bout of Montezuma’s revenge, which is the only reason I would pay to use a public restroom in the first place. 3. Does it have water? One point for water - both in the toilet* and at the sink to wash your hands (which is absolutely necessary if there is no toilet paper - see above). Soap is a nice feature and hand towels/hand dryer may score extra (as a miscellaneous feature), though, most of the time the air outside is like a furnace so a few shakes of the hand as you exit are good enough. If there is no water in the bowl, there may be a barrel that you need to dip into with a pail to pour into the toilet. If you have a particularly rigid poo, this may be an optimal way to flush. To a large extent, this is a subjective standard. As an American male, I’m accustomed, especially at sporting events, to a puddle in front of the urinal and I’ve learned to accept it and approach with a wide stance. In totality, however, there are many things to look after in this category. The most obvious - are there turds floating in the bowl and/or is there used toilet paper on the floor - are only part of the “cleanliness” checklist. *As a rule in Mexico and Central America, toilet paper goes in the trash, not the bowl. Depending on how often the can is emptied and the intestinal health of the previous users, this has high potential to make the toilet “not clean”. ** It is worth noting that the toilets at the state-run Mexican gas station Pemex are uniformly clean and generally earned 4 to 5 stars. Because U.S. gas station toilets are usually a no-man’s land this caught us by surprise - but we were regular users of the Pemex when in Mexico, even camping in the parking lot of a station one night. Further, this provides a new perspective to the Tea Party Americans thought that state-run monopolies are bad. If even Mexico can provide a clean gas station toilet, think what the U.S.government could do to a national health care system. In addition to the four or five stars a toilet may be awarded based on the above categories, a star may be added (but not above five) or subtracted based on any combination of miscellaneous factors. Some we have considered are mentioned below. Many public toilets in Mexico and Central America cost a small fee to use. There will be a person, usually an older woman, sitting at a desk at the entrance who will hand over a few sheets of papel hygenico in exchange for your few pesos. Having a “bathroom manager” means these toilets are mostly clean, but it is bothersome to have to pay just to take a leak. No doubt this is why we often see men standing along the side of the road taking care of number one. Lights are often nonexistent or nonfunctioning, which could be a good thing - if you can't see the mess, maybe it isn't there (unless you can smell it.) However, no lights is usually a neutral factor and is only counted negatively on the rare occasions we need a public toilet after dark. Some toilet spaces are so small that your knees bump against things, which is definitely a gross out factor if there are stains on those things. Lots of space may mean places to hang your clothes if you are one of those that likes to get comfortable before getting down to business. Many restaurants also double as a tienda (small store), gift shop, or even as a car wash or automobile repair shop. 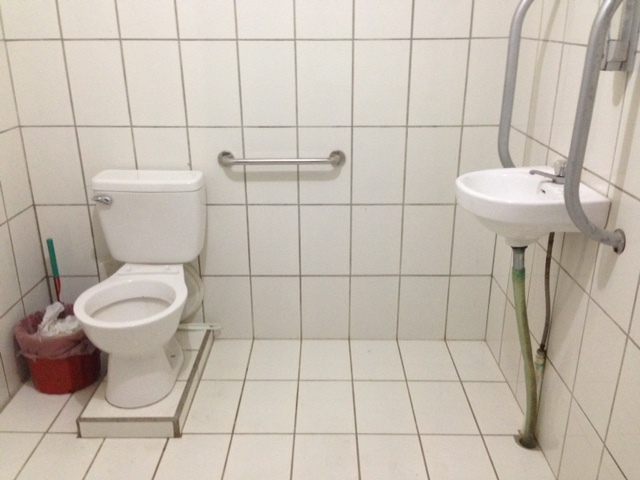 Placement of the bano in these instances should consider the customers’ need for privacy. I hate to be obvious, and walking through the garage where the grease monkeys are lounging with a roll of toilet paper under my arm is a dead giveaway. Doors are also nice. So there you have it, generally, this is what we think abut when rating a bathroom, and there is always room to add or subtract stars based on the unique features of the particular dumping station. But in our books, a bathroom that is free to use, has a toilet with a seat, water in the bowl, toilet paper, nothing gross on the floor or walls, smells okay, has no crawling or flying bugs, and that allows you to stretch out while seated, and also has a sink with running water and soap is a five star toilet. We may or may not take a photo, but at the very least, we’ll come out and let the others know that it was a five star operation. Those don’t come around too often and you want to take advantage of them if you can.